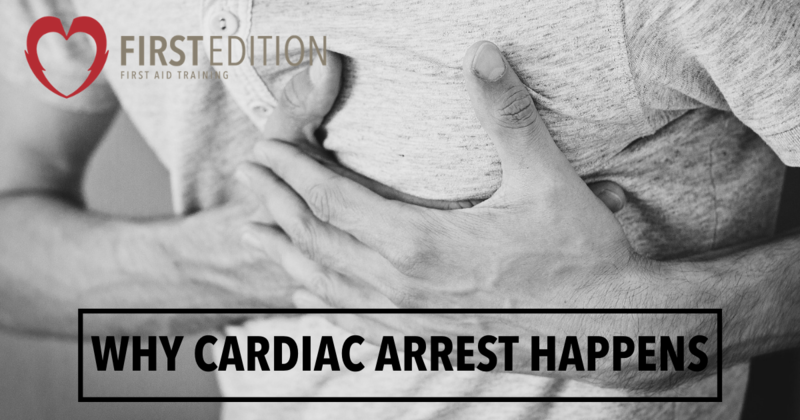 Why cardiac arrest happens - First Edition First Aid Training Inc. According to the Heart and Stroke Foundation of Canada, 35,000 to 45,000 people die of sudden cardiac arrest each year with a frequency of roughly 1 per 1000 people 35 years of age or older per year. Sadly, the survival rate of victims of sudden cardiac arrest (outside of a hospital) is approximately 5 percent. Sudden cardiac arrest is immediate and severe, and can occur without warning. It is important to note that cardiac arrest is not the same as having a heart attack. A heart attack occurs when a blockage prevents or slows down the blood supply to the heart, but the heart continues to beat. In the case of cardiac arrest, where cardiac means ‘heart’ and arrest means ‘stop’, the heart literally stops beating properly (going into fibrillation – a quivering of the heart without proper pumping), resulting in the loss of heart function. This also will cause a person to stop breathing and lose consciousness. In certain instances, a heart attack can create electrical disturbances which can cause a person to go into cardiac arrest. When the heart stops beating, blood also stops flowing. Brain death can occur in as little as three minutes. In most cases, sudden cardiac arrest occurs when a diseased heart’s electrical system malfunctions and experiences ventricular fibrillation, a type of arrhythmia that results in the heart pumping little or no blood to the body. When the heart’s pumping action is disrupted, the heart cannot pump blood to the brain, lungs and other organs. If left untreated, ventricular fibrillation is fatal. Who is at risk of going into cardiac arrest? Simply put, cardiac arrest can happen to anyone, at any time, at any age and without warning. However, having congenital heart disease (heart defects present at birth) or coronary heart disease increases a person’s risk of cardiac arrest. Learning life saving measures, such as Cardiopulmonary Resuscitation (CPR), is advised for every single person. First, call 9-1-1. Then act quickly! Time is of the essence when a person goes into cardiac arrest. Don’t wait for emergency medical services to arrive, start CPR immediately. It could save a person’s life. CPR, even if performed incorrectly, increases the chance for survival. Cardiac arrest can affect anyone, without warning. If you are experiencing shortness of breath or heart palpitations, see a doctor immediately. Learning CPR can help save a person’s life, it’s worth the time and expense to get the proper training.